Gus Fring, by Anthony Petrie / Image courtesy Sony Pictures Television. There are many things that appear in the AMC series “Breaking Bad” that we wouldn’t recommend bringing into your home: crystal meth, body-dissolving liquids, vacuum bags full of cash. But limited-edition posters inspired by iconic moments on the critically acclaimed show about a high school chemistry teacher-turned-meth cook? That seems safe enough. The Los Angeles-based Gallery 1988 has partnered with AMC on the Breaking Bad Art Project, a campaign that rolls out a new show-related graphic each week for 16 weeks. (So far, 10 have been revealed.) The screen-printed posters go for $50 each and only the first 200 buyers get to snag one at this website. When they’re gone, they’re gone. Gallery 1988’s Jensen Karp approached AMC about the campaign, which promotes “Breaking Bad”s fifth season, premiering this Sunday. Karp then went to his stable of graphic artists with an assignment. 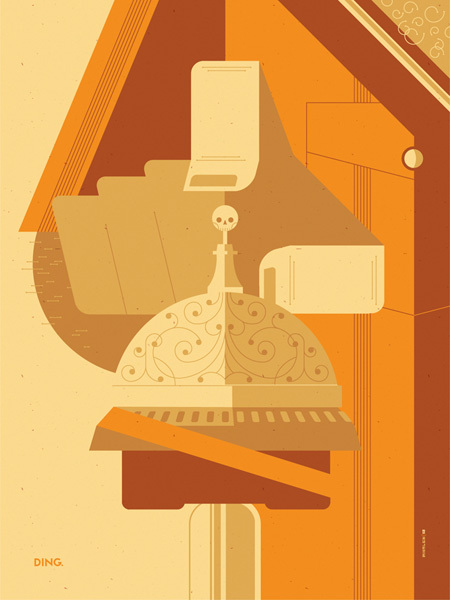 Tom Whalen, a Philadelphia-based “retro-modern” artist was given three weeks to complete a poster inspired by the elderly cartel leader Tio Hector Salamanca. Whalen had never seen the show, and had to quickly study up on the non-speaking character. For the poster, Whalen zoomed right in on Hector’s right index finger, about to push down on the bell. Whalen began his “Breaking Bad” education by first watching the incendiary season-four finale, in which the bell plays a prominent role. He has since gone back and watched the entire series. Anthony Petrie, a Rhode Island-based designer, hadn’t watched the show, either, before he got the big assignment of drawing Walter White’s boss, Gus Fring. It was his first professional commission. “There was definitely a lot of pressure being such a pivotal moment of the show, and it being my first professionally commissioned print,” said Petrie, who “burned through” the series in two weeks. The image that resulted is a depiction of Gus after the explosion in the “Face Off” episode. 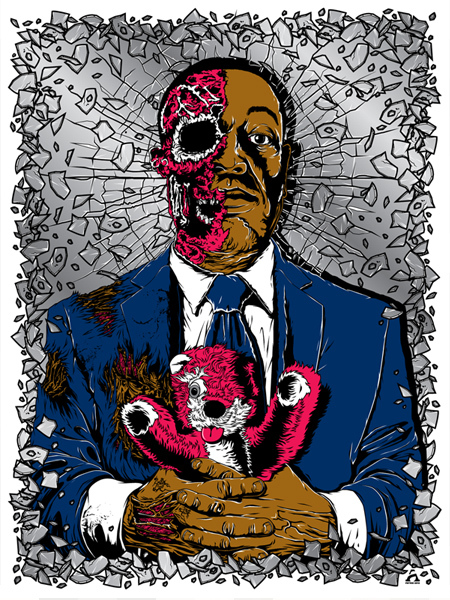 Always dapper in his blue suit, the now one-eyed drug king is holding the also one-eyed pink teddy bear that has been appearing since the second season. Who needs a pastoral Monet knock-off, when you can frame that and hang it over your fireplace? For more on “Breaking Bad,” see Neal Justin’s interview with series creator Vince Gilligan in Sunday’s Star Tribune.